Guests at Villa Col di Casale fall in love with the cosy atmosphere created by the owners who offer a home away from home and a romantic retreat, not just an ordinary villa. The antiques are all unique pieces collected for their beauty. Original art work and textiles add warmth and character throughout. The owners care so much about detail they hired a set designer to complete the finishing touches. Downstairs is a full kitchen, large living room with open fire place and a dining room. Large terraces surround the property are suited to outdoor dining and relaxing. The grand master bedroom suite is the size of a small apartment with elegant antiques including a 19th Century italian gilt bedstead, early 19th Century Florentine dressing table mirror, French antique writing desk. Within the en-suite bathroom is the fantastic copper bathtub, large marble shower bathroom. The generous adjoining sitting room is also filled with antiques like the impressive turquoise Italian wardrobe, chairs, lighting fixtures and comfortable sofa. Candles abound for the most romantic of evenings. The Lavender room has added exoticism with antique Moroccan lighting grand antique mirror. It feature a super king bed and velvet armchair. Linked to the elegant en-suite bathroom with a roll top Victorian bath. The Twin room features two elegant French antique beds, comfortable armchair and painted Italian 19th century wardrobe. This is the only room not en-suite, instead there is a generous shower room across the hall. The Loggia Room features an antique French king bed, mirror and wardrobe, linking to an en-suite marble wet room. It leads out to its own balcony with exterior steps for more privacy. One of our best-kept secrets, this villa is surrounded by 117 private acres and nestled in the green hills of Umbria. 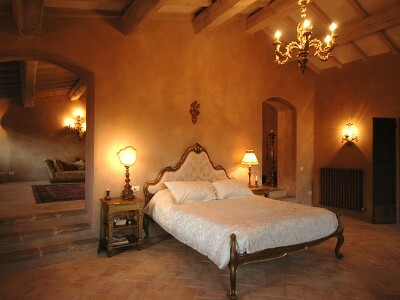 Villa Col di Casale is a charming luxury villa with four bedrooms, sleeping up to eight people. It is set amidst vast meadows and forests with far-reaching views across the sweeping Umbrian hills and valleys. The seclusion and privacy it affords have made it a popular retreat for film stars and captains of industry. The former ballerina now an interior & jewelry designer and actor & theatre owner couple spent years planning every aspect of the design. The villa has the quaint appearance of an Umbrian farmhouse from the outside, but is definitely more 'palazzo' on the inside, with grand archways, stone floors, elegant interiors and large terraces. A more private alternative to a boutique hotel in Umbria, Villa Col di Casale is perfect for families and friends looking for a luxury base from which to explore the green heart of Italy. The villa is suitable for special events and has hosted weddings due to its picture perfect setting. A local concierge is available to ensure your stay is personalised and on hand for suggestions of where to go, including organising a more frequent maid service and private chef. The villa is suitable for children of all ages and includes two baby cots. The villa has a minimum 4-night stay policy. The entire villa must be rented, it is not possible to rent individual rooms. We are an artistic couple and have fulfilled our dream of renovating and interior designing our beautiful 18th-century farmhouse. It took us two years of restoration after 70 years abandoned to create the space. All interiors were sourced by us in London to create an intimate feel. Our previous guests call Villa Col di Casale 'beautiful, tranquil, inspiring, an Italian idyll' - that's why we regularly visit ourselves. Not far from Villa Col di Casale are charming Umbrian towns and cultural hot spots to explore including Perugia; the capital of Umbria, Assisi and Gubbio. Do also visit the Tuscan town of Arezzo which holds antique markets and fantastic shops and restaurants, and Cortona with its cobbled streets and little boutique shops. All of these are within 45 minutes drive whilst Siena, Orvieto and Spoleto, which hosts an international theatre & music festival every year, are a little further afield. Closer to home is the charming medieval town of Montone; one of the prettiest hilltop towns in Italy, it is home to a yearly film festival in July and has a couple of great restaurants. For banks, supermarkets and chemists head to Umbertide which is just 15 minutes drive from the villa. The swimming pool at Villa Col di Casale is in a picturesque setting in front of the villa and enjoys views across the valley - it can be heated for a small fee, which we recommend in early summer. The pool is open from May until the end of October. WiFi is accessible throughout the villa and there is satellite TV. There are three terraces around the villa, ideal for al fresco dining as the sun sets, with a barbecue for guest use. A private chef can be organised. Villa Col di Casale is a 45-minute drive from Perugia San Francesco d'Assisi International Airport (Approximately 38.3km distance). The nearest train station is in Perugia (Approximately 27.2km distance). Car hire is essential if you want to tour the area. Perugia San Francesco d'Assist International Airport is 45 minutes by car. Ryanair flies direct from Stansted in the UK. Rome, Florence are both a two-hour drive, Pisa is a two and a half hour drive. Cancellation fee is 100 % of total charge if cancelled up to 42 days before arrival. Cancellations within 6 weeks of the arrival date will unfortunately not be refunded. There is a minimum 4 night stay. Rates at Villa Col di Casale include pool cleaning and villa cleaning twice per week and the final clean. Additional cleaning can be arranged for 40 euros per 3 hour visit, paid locally. The outdoor pool can be heated for an additional £200 per week, please notify us in advance and it is closed from November - April.